Are there are drawbacks to using a treadmill at work? Can there be a future for iMovR? Has anyone ever thought about using a treadmill at the office? Well, sure, treadmills can be found somewhere in a corner in most corporate world high-rise buildings. 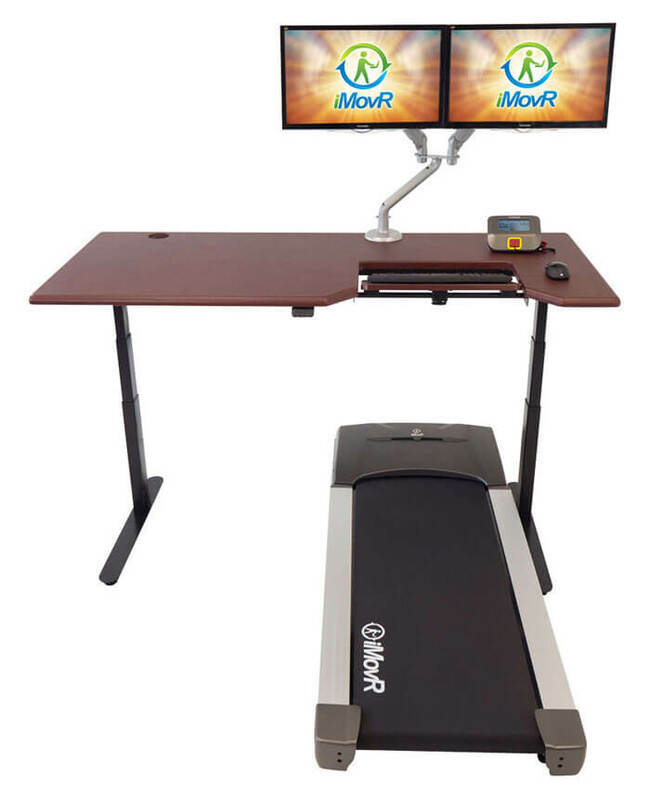 But it seems that iMovR has managed to bring the treadmill from a dusty corner to the work desk. 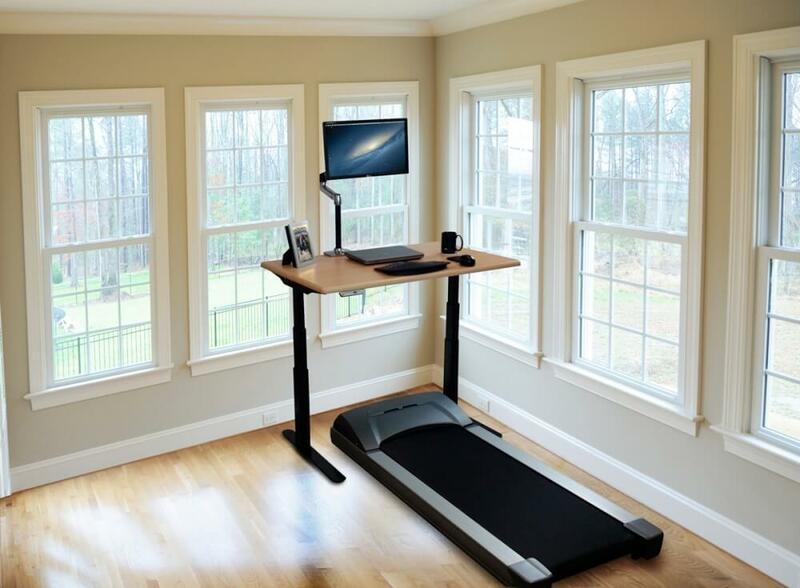 As crazy as that sounds, the company is now offering integrated treadmill-standing desk workstations. These are not the usual products you would normally go with at the office. There is actual proof that working while walking on the treadmill can come with some benefits. The fans of iMovR standing desk are also a testament that there are not simple stories and that people are actually enjoying these designs. There are a few iMovR standing desks to consider. However, the most interesting choices are definitely those combining a treadmill with a standing desk. Before dismissing the idea, there are a few considerations to make. First of all, the purpose of this setup is to keep people active. It is known that office workers might not be the fastest or the healthiest due to the sedentary lifestyle. Furthermore, there are a serious of health conditions which can arise in the future due to a sedentary lifestyle. Heart conditions are among the most frequent health for sedentary office workers. With longer hours at work, poor nutrition and a sedentary lifestyle, this is a sure recipe for disaster. Even healthy people will eventually start to show signs of health problems due to this lifestyle. Simply put, the human body is not made to sit in front of a screen for 8-10 hours per day. But since this can’t change anytime soon, the approach of the modern worker can. Having the ability to do even 10 minutes of exercise per day can improve cardiovascular health. 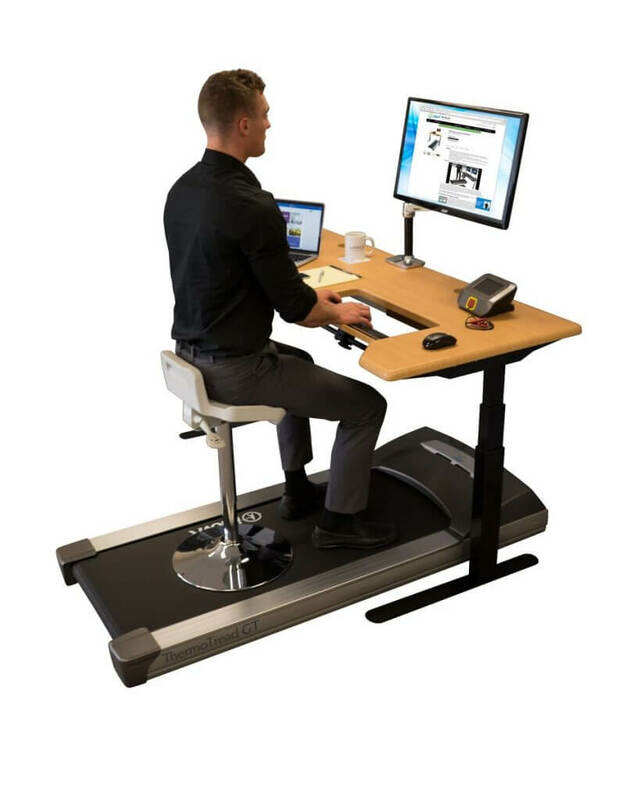 Of course, office workers will not run on the treadmill while working. However, they will burn more calories with this approach. The main purpose of the setup is to get office workers active again. But there is a science behind this setup. Simply eating at work without burning calories might be harmful. Even standing burns calories so having a standing desk is greatly appreciated in the calorie department. However, walking for a few minutes per day can consume those extra calories from the delicious muffins, cappuccinos, lattes or cheesecakes at the cafeteria. Office workers might also be tempted to consume unhealthy snacks at work. Building stress is also responsible for unhealthy eating habits. It is why combining the treadmill work lifestyle with better foods while at work can be the first step towards a healthie lifestyle. Also, it must be said that the treadmill might be the only exercise some people get in a day. So people arguing the treadmill at work is a bit too much are usually those who have no physical activity. Nobody is stating that office workers need to sweat at work. But iMovR knows simply walking more is a distinct advantage. Of course, the idea is not for everybody. But there is a small niche of workers who think of the big picture and who want to live a longer and healthier lifestyle. In theory, a treadmill doesn’t have any drawbacks. Neither does a height adjustable desk. On the other hand, when something is too much, it can be harmful. So for example, obese workers who want to jump straight on the treadmill for hours need to be a bit more reserved. Getting in better shape is a long term process. Those who love the process are those who actually achieve their goals. It is why obese workers should only use the treadmill for a few minutes per day. This can be gradually increased during the following weeks of using the setup. The reasoning for this is quite simple. The extra weight of the body often puts pressure on joints such as the knees. With a lower body weight, obese workers can start to walk more at the office. Other impediments would come in the form of noise. Even with quiet motors, walking on the treadmill creates sounds. These sounds can disturb work colleagues. It is where there needs to be a sensible approach on where the setup is placed and when it is actually used. If all office workers started to walk on the treadmill, there would be considerable noise in the area. Another important aspect to consider comes with typing. But the good news is that iMovR has a plan for this need as well. It can be complicated to type while walking on the treadmill. However, there are good reasons not consider this issue as simply typing while on the move is complicated. But the tilting keyboard support offered by a few standing desks from the manufacturer are hard to argue with. There are totally different from what the market has already offered and surprisingly, they actually work. Reading product reviews reveals customers actually enjoy these solutions. Even more, there is plenty of room for improvement when it comes to typing and as a proof, there are new keyboard designs released every year. What is known is that there is no keyboard for everybody. Adjustable keyboards might be the future. But iMovR points out that it’s not necessarily the keyboards which need to be changed but rather the angle in which they are used. Every user has a certain height and arm length. The adjustable angle on the SteadyType Treadmill Desk is what can be considered as the ultimate freedom of adjustability. Not all products made by iMovR actually integrate smartphone technologies. But there are a few setups which are able to connect using a dedicated smartphone app. The official apps is minimalistic. It comes with the sole purpose of simply offering a solution which is easy to use and which stands out in terms of height adjustability simplicity. Of course, those who are not new to standing desks know that there are plenty of opportunities to find an integrated solution with smartphone apps. However, being on par with the leading options on the market makes a statement about the brand. iMovR also manufacturers multiple other products. They include standing desks and standing tables. These tables can be multipurpose. They can be used in a wide variety of occasions and they represent a great solution when it comes to the variety of events and offices they can be used in. Standing mats monitor arms and cable organizers are also available from the manufacturer. Even more, there are plenty of instances where things can actually get easier, especially when it comes to proper multi-functionality at the office. These integrated solutions can be used together and clients can create their own office space. Some customers may ask if there are any special deals offered by iMovR? The manufacturer offers discounts for bulk purchases. These purchases are typically made by companies who need multiple desks, chairs, standing mats, and any other accessories for new office space. In the conditions in which there is no transparency about the right discount percentage for the purchases, clients need to contact the company directly. This is still an area which can be improved, similarly to what Varidesk does. Other brands on the market have a clear upfront discount policy which can work in favor of the company. Pricing transparency needs to be implemented by companies who want to make a difference. There is an ongoing online debate about the future of iMovR. However, most customers are not aware of the brand’s identity at the moment. They might even think that these standing desks with their treadmills are to become mainstream and they should be used by everybody. But this is not the purpose of iMovR. The company has a select pool of customers and fans and it only offers these clients current and future products. Of course, some of the products from iMovR can have a mass market appeal. But when it comes to treadmills, they are clearly a niche product. At the same time, if the products get perfected in the future, they can open up a new space in the office culture. With a dedicated area for relaxation and working, it can open up new opportunities for businesses which want happier employees. Even more, there is a clear understanding that the products are actually different. One of the intriguing factors about the products is that they are mostly shipped faster than competing products. Since these standing desks are made in the USA, they can be delivered within a week in metropolitan areas. But of course, not having an outsourced production also means iMovR has higher prices than the competition. Their products are not necessarily more durable. This is one of the major drawbacks to what the brand has to offer to the modern office worker. Since the parts are assembled in the country, the final prices are way above the average of this segment. However, these standing desks from the manufacturer can be considered by those who are proud owners of home products. With growing imports, the company still shows that quality products can be made right at home. If it manages to perfect them to a higher standard and to lower the price for its leading products, iMovR can be one of the interesting options for a large number of buyers. Even more, there is an understanding of how the company grows from product to product as it builds on what it already does very well instead of revolutionizing with every new release. 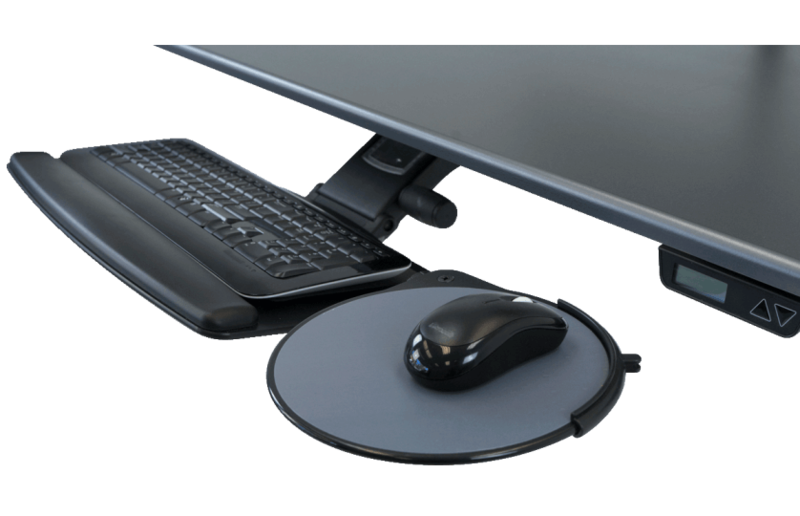 iMovR makes a large number of adjustable desks. The company offers impressive results when it comes to better work-life balance without actually making office workers leave the office. With better posture, workers can hope for improved help. With an added treadmill, they can also keep the excess weight off as well. However, there are a few considerations to make, especially if planning to use these products for years and years. One of them comes with complete mental breaks from work. They can be harder to plan as workers might be in front of the screen and on the treadmill even during the break. Taking care of vision also means stepping away from screens at least every few hours. This is not something deliberate from the manufacturer but rather an issue and a consequence of a work style which keeps people at the desk longer than they need to be. At the same time, as with any other consumer products, it is how they are used what determines the ultimate results. These products are easy to use and they can be an interesting choice which stand out and which offers better health. If used accordingly, having the possibility to sit and stand at the same desk can improve posture and reduce pressure on the lower back. Adding a treadmill in the equation can only lead to better overall perspectives when it comes to weight management. Of course, those who are serious about fitness are already active besides their jobs. So it can be said that iMovR targets people who are at the beginning of their getting in shape journey. It can also be said that the company’s products are aimed at those who have busy lifestyles. These lifestyles keep them sedentary for days. They don’t allow any free time for exercises. Furthermore, having the ability to count on US-made products can also come with its own pool of fans. Combined, these characteristics lead to a very specific ideal customer of the iMovR products. It is the person who wants to get in shape and which values products for what they are, even if they cost more than the alternatives. If iMovR manages to mature these products, there is certainly a future for the company.